Gone are the days when men were expected to eschew all moisturisers and tough-out callouses and blisters as if they were a member of the SAS. Now, in fact, it’s desirable to have take care of yourself, especially your face and hands – after all, they’re on display all the time and no-one likes a rough and crispy handshake! To help you keep your digits in tip top condition, we’ve rounded up the best hand creams where the packaging is as delicious as the contents. Keeping a big bottle of moisturiser next to your sink is a great way of remembering to moisturise your hands. Le Labo’s 250ml bottle has a handy and hygienic pump and will keep you going for ages… unless you keep it at work on your desk, where we guarantee your colleagues will want to use it too, because it smells delicious. Infused with basil, sweet almond and safflower oils, it'll nourish, soften and hydrate skin, as well as making it smell great. The cream is vegan and paraben, phthalate and artificial colourant-free, making it perfect for sensitive skin. Grown Alchemist’s vanilla and orange peel hand cream comes in a dinky size that’s perfect for stashing in your pocket or bag, but it smells so good you might use it up rather quickly. The cream is blended with rosehip and camellia oils to nourish your skin without leaving it greasy and has a refreshing vanilla and orange scent to perk you up through those mid-afternoon slumps. Just like the scent, the packaging is sophisticated too, and takes the form of a stylish monochromatic tube. If you like to make sure you smell great throughout your working day, but applying cologne at your desk is a little too conspicuous, why not consider a highly-scented hand cream? Byredo makes some amazing perfumes that are super fashionable, but its Suede hand cream is equally luxurious. Formulated for a light yet nourishing texture, the cream cleans, hydrates and softens your hands without leaving any annoying, greasy residue behind. Most importantly, it's scented with crisp accords of bergamot, lily of the valley and pear, which mellows over time to reveal a base of soft musks, amber and velvet plum. Yes, it's on the more expensive side, but it’s much cheaper than investing in the perfume! If you’re bossing Veganuary, Aesop’s indulgent, plant-based hand cream may work well with your new, clean-living lifestyle. The cult favourite hand cream contains nourishing plant-based ingredients, including coconut oil and shea butter for super soft hands. Notes of mandarin orange, rosemary leaf and cedarwood make for a refreshing and uplifting scent too. The balm is affordable for 75ml and the packaging is super slick, making it a good one to whip out at work and leave on your desk. L'Occitane’s shea butter hand cream is bit of a classic. Enriched with honey, almond and coconut oil, it repairs dry and fragile hands while giving them a year-round protection. It’ slightly scented with jasmine and ylang ylang essential oils, which makes for a good unisex scent and the metal packaging with vintage-looking French label is pleasing. It’s no wonder it has spawned a hundred copies. Launched in 1994, it’s one of the brand’s bestselling products, with one selling every three seconds. If you’re feeling patriotic, why not plump for Heath hand salve, which is a made in England and comes in a pleasant green tube. Dubbed a ‘hardworking, non-greasy hand cream with anti-pollution benefits to moisturise and protect dry, overworked hands,’ its ingredients include shea butter and Pro Vitamin B5. It also includes something called Pollustop, which the company says 'actively shields from everyday pollution and protects hands and nails' and while we’re not sure how, it sounds great! Perhaps as importantly, the 75ml cream has a refreshing mint and lavender scent. Clarins has been making hand cream for men for longer than others and it’s deeply conditioning, repairing and protective cream is specifically formulated for men’s hands. The formula is non-scented, which is great news for those with sensitive skin, and it’s non-oily and ultra-sheer formulation is absorbed quickly, making it a great choice for on the go. While the packaging isn’t the prettiest, it’s super practical and easy to throw in a bag or pocket without worrying about a metal tube splitting. If you like your hand cream fresh and fruity, Kiehl’s richly hydrating hand cream may be for you. Its simple but invigorating grapefruit scent will make it a hit with everyone. The hand cream has a rich, velvety formulation including shea butter and Vitamin E and is designed to leave skin feeling soft and hydrated all day. The packaging is classic Kiehl’s and has bright orange lettering, which should help you find it if it’s in the depths of your bag or luggage. Jo Malone London’s Vitamin E nourishing hand treatment is a bit like the Rolls Royce of hand cream, but unlike the flashy car, is a little piece of understated luxury within touching distance for more people. The light cream ‘instantly’ soothes dry skin, while helping to hydrate, soften and restore vitality, and comes in a smart black tube. While the product is on the more expensive side, the cream is more reasonable than one of the brand’s luxurious perfumes and still leaves a lingering and sophisticated pomelo and cassis scent. L'Occitane Verbena cooling hand gel is something a little different as its gel consistency is designed to be cooling. The gel/cream is enriched with organic verbena extract from Provence to moisturise and refresh. Instead of feeling slightly greasy or sticky, it leaves an unusual powdery finish on hands, but is still moisturising. The product is enriched with mint and thyme essential oils, known for their purifying properties, so it penetrates instantly and leaves hands soft and perfumed. If you like to invest in your appearance and home, this hand cream may be for you. 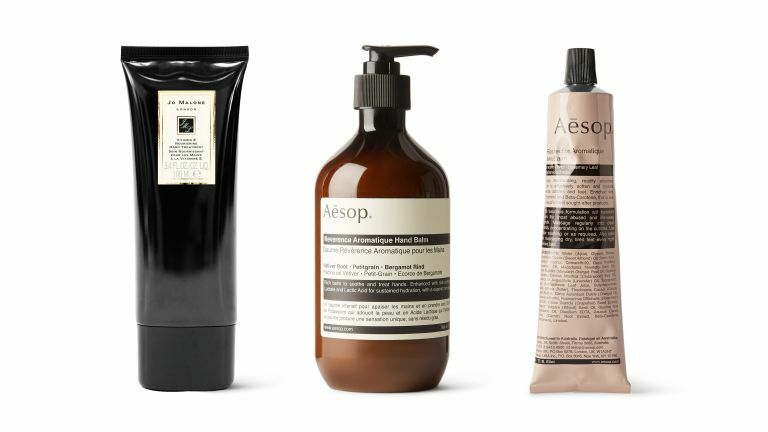 Aesop’s Reverence Hand Balm boasts the brand’s covetable packaging and would look ace in your designer bathroom. And while it’s an investment, you can justify it because the bottle is a stonking 500ml and comes with a handy pump. At that size, you won’t have to stock up again for a while, or you can be super generous with the sumptuous-smelling cream, which is infused with a blend of fragrant botanicals including vetiver root, petitgrain extract and bergamot rind. This gives it an earthy aroma, as well as softening and relaxing properties that’s popular with men and women alike.